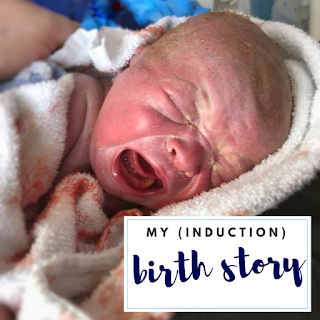 Ahh, the birth story. Obviously I had a birth plan - fairly loose, but still. Spare room has been converted into the birth room, the pool was ready, fairy lights were carefully arranged around the room, affirmations were printed and stuck to the walls, playlist has been made, snacks for me and the midwives were purchased (and had to be replenished a few times because it's actually very dangerous to have a bag of snacks at home)... and there I was, on the 1st May, checking in for my hospital induction: no pool, some fairy lights, and most definitely no snacks! While on a walk on the seafront, I got a migraine but I dismissed it because I've been having them quite regularly at that point in my pregnancy. However, after getting home I wasn't able to speak so James (after the initial happy dance) freaked out and called 111 who sent the paramedics in the ambulance to assess me. Paramedics decided to take me to the hospital because of the suspected pre-eclampsia. Blood tests at the hospital showed that my ALT were rising since Thursday and I was scheduled for an induction the next day with the view to go to a c-section if things didn't improve. I was offered another sweep which I accepted in hope to avoid the induction of which I heard many horror stories. I was admitted to the hospital for an induction and given a pessary around 1pm. As I was feeling completely fine, I went for a coffee with my mother in law and then a seafront walk with my mum. I got back to the hospital when James got back from work and I was then given another pessary as clearly nothing was happening on the -let's-get-this-baby-out front. We then sneaked out for another seafront walk and I did lots of crab walking on the stairs much to amusement of passers by. We walked past a gig, which was quite surreal - there were lots of people queuing up to get in and we were there strolling waddling past them, waiting for our baby boy to be born. About an hour into the walk I started to feel quite uncomfortable and decided to get back to the hospital. The pain was very much like you read online - a uncomfortable lower back pain, like a severe period pain. James went to get us some food (I requested a burger from a chip shop!) and we ate it in the hospital while I was bouncing on the ball trying to relieve the pain. However, the pain got quite intense and seeing as I couldn't eat anymore because of it I reluctantly went to speak to the midwives on call, expecting them to dismiss the pain as the beginning of the contractions and to tell me to grin and bear it! I was strapped to the monitors and it turned out that I was having between 6-7 contractions per 10 minutes and they were coming in thick and fast - the midwives were surprised I didn't complain of the pain (I was too to be fair as I have a famously very low pain threshold!). Seeing as Munchkin was not distressed by the contractions in any way, I was left to it, hoping that the labour will establish properly. An hour later my contractions still kept going on strong but I wasn't dilating at all. I was experiencing something called uterine over-stimulation - basically when the induction hormones make your uterus go crazy but the rest of the body doesn't get the message that it's go time. Suddenly, at 2am, there were numerous doctors and midwives appearing in my little cubicle, desperately trying to work out what to do with me. I refused all the drugs as I felt that I could handle the contractions well and I didn't want to stop the labour. 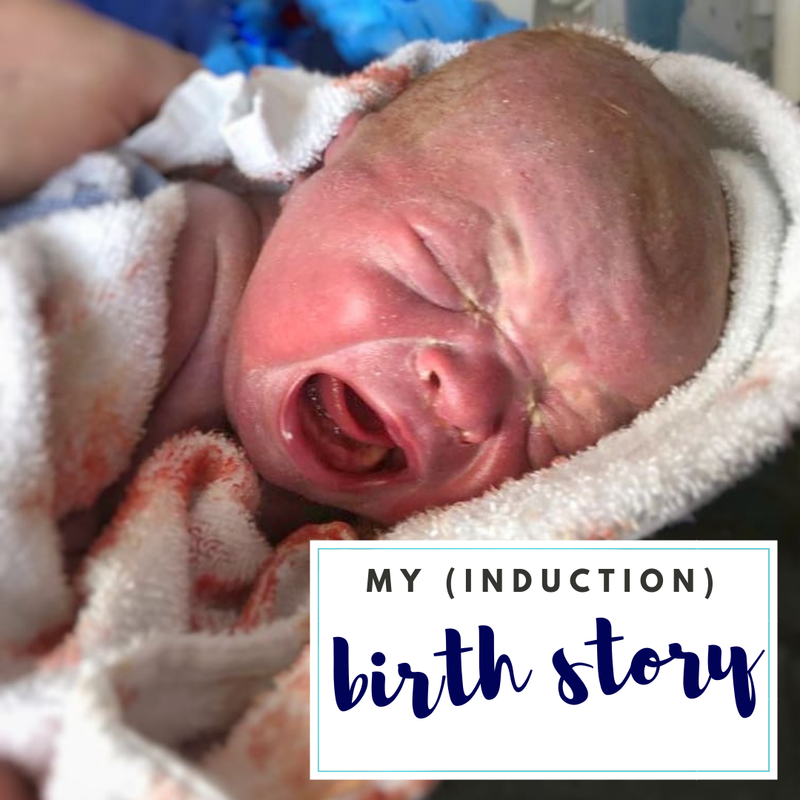 However, it soon became clear that I wasn't progressing at all and to limit the risk to the baby, I had to be given an injection to stop the contractions. I felt so incredibly disheartened - I thought this was actually it and I was going to hold my little baby boy soon. The midwives were very sympathetic and let James use a bed next to me as the antenatal ward was empty so he could stay with me overnight. The plan was to have a bit of rest and then go to the labour ward as soon as a room was available and to manually break my waters to kick start the labour (again). I woke up just after 6am needing a wee, I got off the bed and...... whoooosh my waters went! I excitedly went to tell the midwives - after all this meant one less intervention. 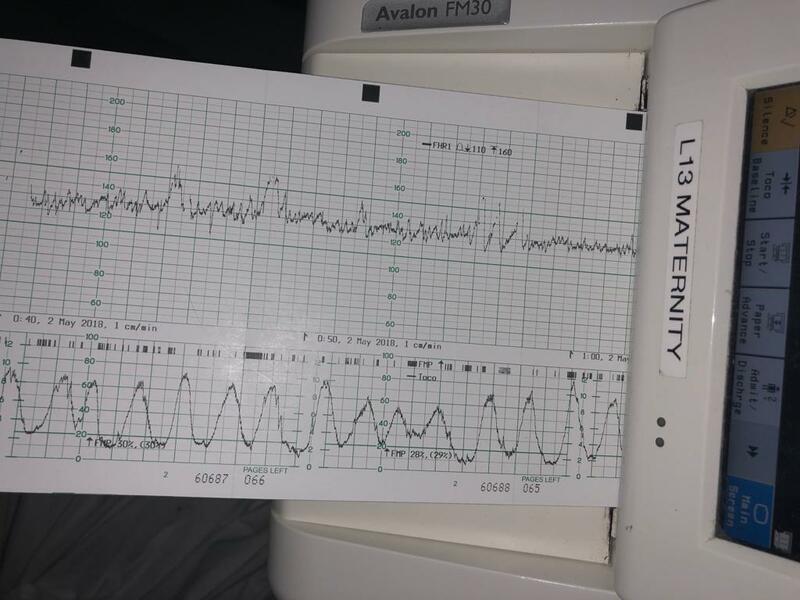 I was monitored again, but my contractions have all stopped by then and I was still only 2cm dilated. The wait for the labour room to free up began. I slept, ate, watched Netflix, walked around the hospital and did some knitting. Midwives kept popping in to check on Munchkin but he was totally not phased by all this and continued to chill out in the womb. Finally, at 7pm we were told that the labour room was free and we could transfer there. 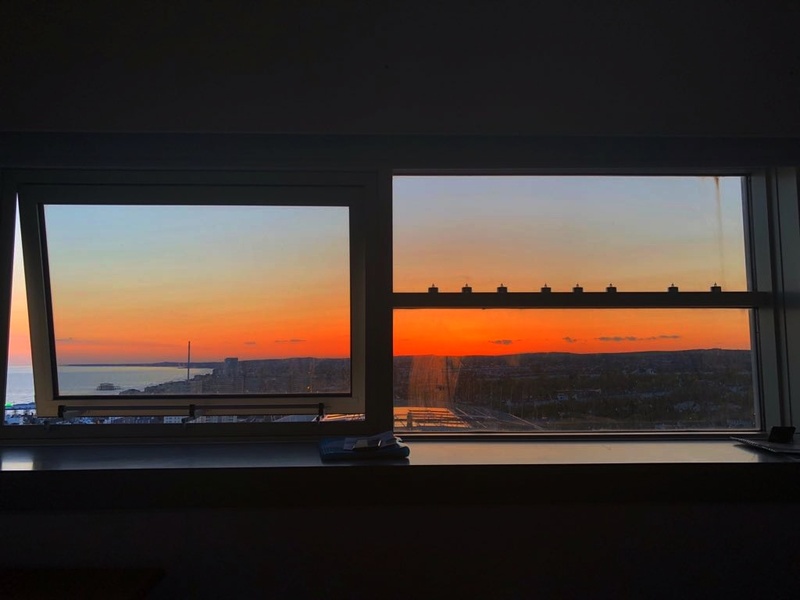 When we got there, I was assigned a midwife - I interrogated her whether she would be the one delivering the baby and she said probably as her shift will finish at 7am the next morning. She went through all the options with us and I chose to have the mobile epidural - which meant I had a little button that released it so I could control how much pain relief I was having (it only released it every 20 minutes though, no matter how much you pressed). This however meant that I was not allowed to eat anything from that point on. My labour was officially established at 9.50pm when I was given the oxytocin drip to kick start it (again!). Around midnight there was some meconium in waters (which kept dribbling like I had a leaky swimming pool inside of me!). I was starting to get very uncomfortable and kept wanting to move around but this was causing the baby's heartbeat to be undetectable (which set all sorts of monitors off!). I was offered to have a small monitor put on Philip's head to monitor his heartbeat. This was quite a weird (but painfree) procedure and I felt a bit like Lara Croft with all these things strapped to my thigh but I also found it weirdly reassuring that his head was within reach if you know what I mean? The next few hours are somewhat a blur - I was dozing on and off, regularly woken up by pain, so I pressed my little epidural button and moved around a bit, before falling asleep again when the pain subsided a bit. The midwives were amazing and were trying to encourage me to sleep so at least I had some rest in that period. At one point I woke up in excruciating pain that I could barely stand - nobody seemed to take me seriously and I got quite upset. I insisted on examination and I was right - in a space of just an hour, I dilated by 5cm, hence the pain. By 6am I was in severe pain and couldn't get comfortable. After another examination it turned out that I was still quite away from the pushing stage and I was getting really tired, hungry and generally quite fed up. The doctor was paged and I was talked through my options - I was keen to avoid the c-section so I agreed to a stronger pain relief to try to keep going. 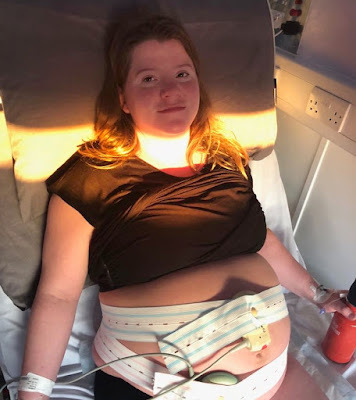 I was given gas & air while waiting for it to kick in and it was great relief - however I found holding the tube quite cumbersome as I wanted to move around (I was very complimentary of the midwives though so it was clearly working!). I fell asleep shortly after. It does seem like I was snoozing at lot but I was so exhausted so I just kept falling asleep if I sat down for a moment - at this point as well I haven't eaten anything in about 12 hours! My epidural was turned off in preparation to help me feel the contractions to push. By 10am I was wide awake with strong pressing pain that came with each contraction and I was crying that I can't do it and it was too much. I genuinely thought at that point that I couldn't do it, I was so tired, so hungry and in so much pain. I was feeling very disheartened as it seemed like I entered the hospital on Tuesday for an induction and on Thursday morning I was still here, no baby, just a lot of pain and discomfort and I haven't slept properly since Monday night either. I moved past the stage of being excited and just wanted it to be over. The midwife reassured me that this was the transition stage and it was natural to feel like this. Suddenly I remembered all those things I read and knew that reaching that transition stage was great sign - things were really moving along now! It perked me up a bit! After another examination, I was finally fully dilated and ready to start pushing. At the beginning I found the pushing quite manageable but I quickly got tired and struggled physically. I tried to change positions but was only allowed that for some time as the midwives were struggling to monitor Philip and there were already concerns growing about his well-being. Knowing that every second mattered helped me to focus on pushing and I worked really hard to get myself to push as hard as I could with each contraction. However, things were still quite slow and after an hour the pediatrics doctors were paged to the delivery room. We were told that due to meconium in waters and my waters being broken for nearly 29 hours at that point there was a very high risk of infection and that Philip might be tired from the prolonged labour and he was unlikely to be able to breathe independently when born. The resuscitating equipment was brought to the room along with a heating lamp to put him under 'in case he needed reviving'. These are the words that you really don't want to hear. It was a scary place because on one hand I wanted to give up and cry with the worry about my poor baby, but somehow I had to persevere through that because I knew that getting him out as quickly as I could would be the best I could do for him right now. And so I pushed, and pushed for what felt like eternity but was in fact 'just' another hour. 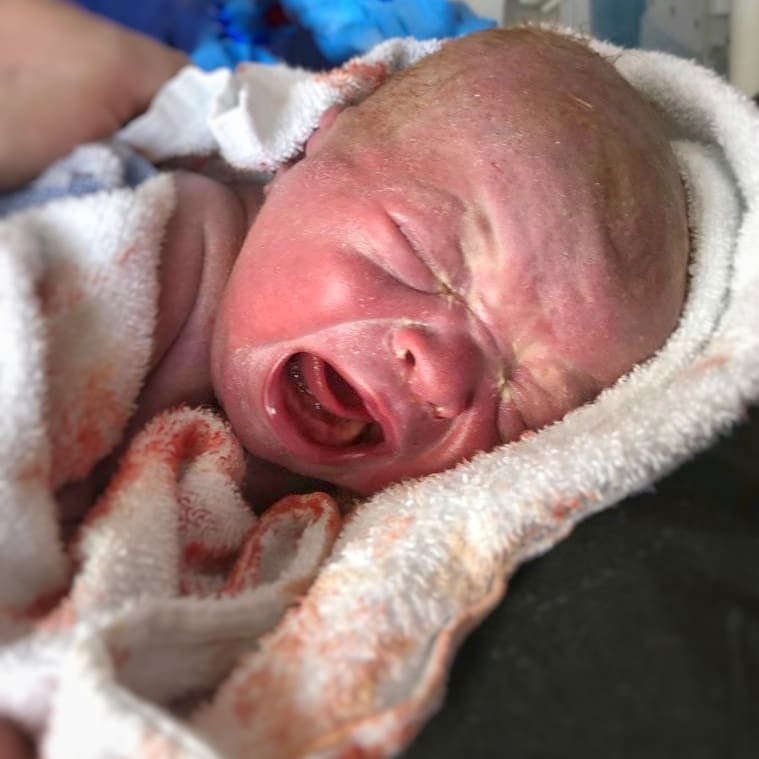 I hit the wall again and the pain became unbelievable - again helpfully the midwife reassured me that this was the crowing stage (the 'ring of fire' name really put things into a perspective) and she told me that she could see his ginger little head peaking through. That brought such a wave of relief - I knew that in a couple of pushes, no matter how unbelievably painful and burning, my little boy would be here! I was terrified what would happen after and that I might not be able to hold him straight away, but he was going to be here and the doctors were ready to take care of him. And with the last push, at 12.27pm Philip was born. He cried straight away and wriggled his little arms and legs about. 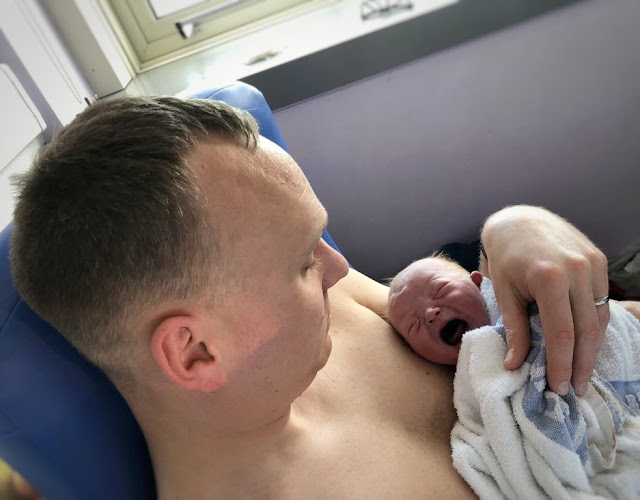 There was no concern about him being able to breathe independently, he was there, screaming his little lungs out - even the midwives commented with relief how loud he was (the boy still likes to be heard when he's upset!). Whole 4.055kg (8oz 15lbs) of a loud, crying, breathing boy. He scored 9 on Apgar's at birth and then 10 five minutes later so I was allowed our golden hour with plenty of skin to skin. I reluctantly passed him to James when I was being unplugged from the various drips and I was assessed after the labour. However, Philip was born with high temperature and suspected sepsis. 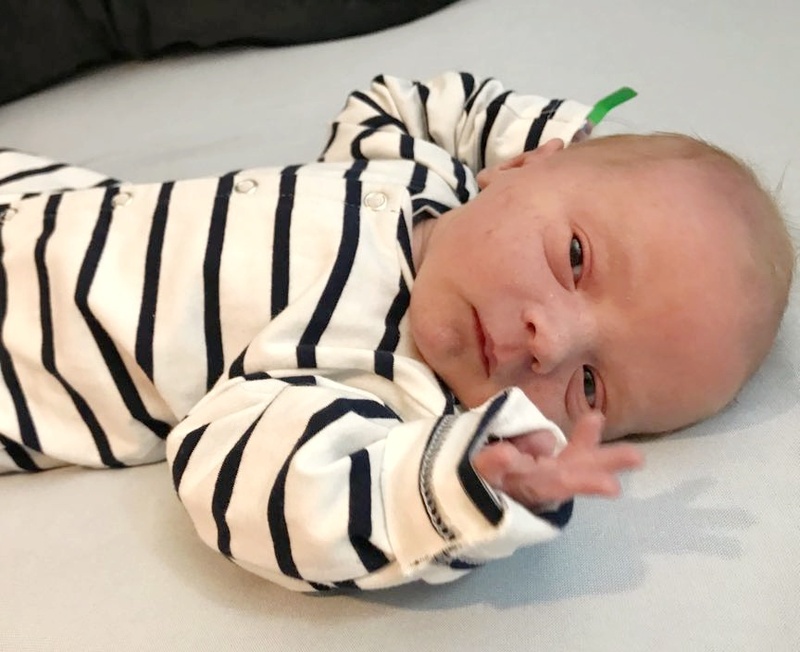 James was asked to take him to the neonatal unit to have a cannula fitted and antibiotics administered. He was also severely jaundiced so we were given a bilibed for him. I was left in the labour room to have a shower - I got that done over as soon as I physically could. I was offered tea, toast & further painkillers but according to my medical notes I declined them so that I can go the the neonatal unit (I still haven't eaten for about 18 hours). We settled in the hospital quite well and enjoyed lots of snuggles with our little boy and we were told we are going to be kept for another day to monitor Philip's infection. Unfortunately on day 2 the markers jumped up very significantly so his antibiotics dose was doubled and he was put on hourly observations. 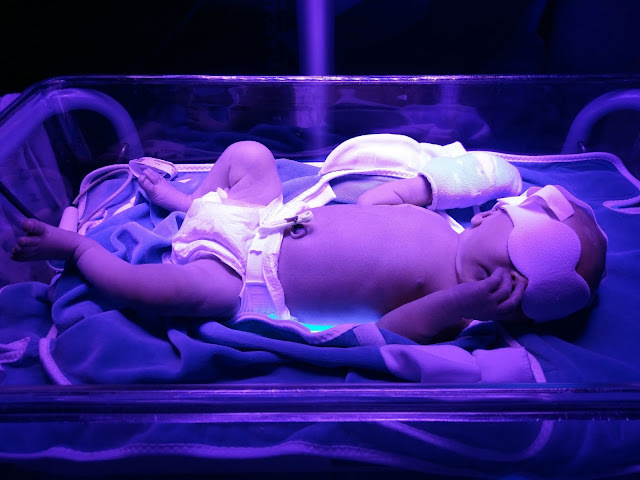 On day 3 assessment, he lost nearly 12% of his birth weight and the jaundice was getting worse. He was put in a bilibed under an additional lamp and we were moved to a private room because we suddenly had all this medical equipment with us and the midwives were in and out every hour checking on him. Due to the weight loss, I was asked to express and bottle feed so that we could monitor how much he was eating. Soon enough he was guzzling more than the recommended minimum of 60ml every 3 hours and he was getting better and better. We continued with the twice daily antibiotics, various monitoring and a strict feeding schedule. He absolutely hated the bilibed and cried a lot. It was heartbreaking, because even though he was right next to me, I wasn't allowed to snuggle him because he needed to be under the lamps. I was only allowed to take him out for feeding so I cherished those sweet moments, but hated with passion the fact that I couldn't breastfeed. On day 4 at 6pm he was taken away for the usual morning blood test and observations and as they all came back much improved so we were given an all clear to go home the next day, provided all the results were improving overnight. It was a stressful night and I couldn't wait for the morning. At 6am the next morning he was brought back from the checks and we were given a go ahead on going home. On the 8th May 2018, we took our little Munchkin home - I took this video of him while waiting for the final paperwork. I was so excited to be able to not only take him home, but cuddle and hold him without any restrictions! Wow, you really went through a lot. You strong, powerful woman. I hope your feel proud of yourself for your determination. You achieved a vaginal birth and managed to get breastfeeding established even with all that going on!